28-Mar-2017: Taskin Ahmed picked up hat-trick in ODI against Sri Lanka at Dambulla. 17-Jun-2014: Taskin Ahmed's 5 for 28 is the best bowling analysis by a Bangladesh bowler on ODI debut, improving upon Sohag Gazi's 4 for 29 against West Indies in Khulna in 2012. 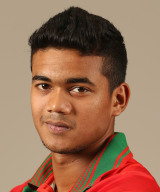 He is eighth bowler take five or more wickets in debut.